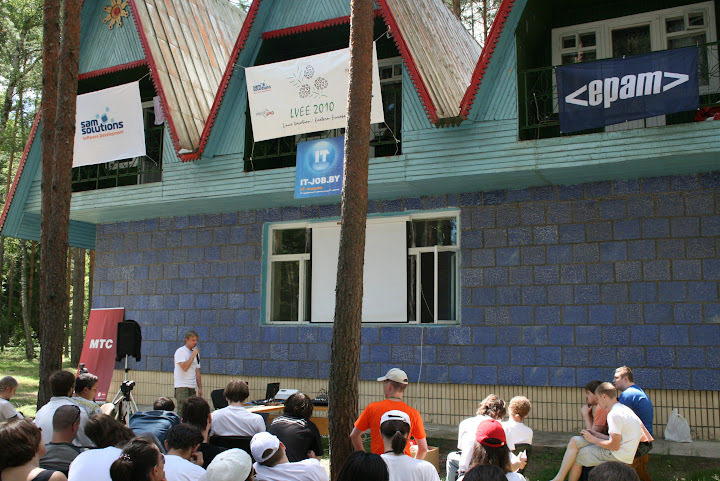 The conference had gathered about one hundred fifty users and developers of free/open software from seven countries at the touring camp near Grodno. More than 30 presentations covered a wide range of topics – from usage of free software in science and business to development tools, FOSS-based portable devices and specifics of free projects and open standards. Community-oriented thematics was accomplished with an open discussion about the social role of free / open source software and themed video viewings. Also much interest was attracted by lightning speeches section, first appeared in this year LVEE. Abstracts of presentations were published as a themed supplement to the IT Bel Belorussian journal, and are also accessible along with slides at http://lvee.org – the official site of the Conference. Videos of presentations, recorded due to it-job.by, the partner of LVEE 2010, are to follow soon. Linux Magazine and IT Business week journals bacame the information partners of the Conference, as far as [Root@UA]Media, IT Event, usability.by, hh.by, PBXWare.ru portals and companies. The Internet connection was provided by MTS mobile network operator, and Wi-Fi coverage of the conference place was provided by the ePoint Systems company.